Niall and Cillian’s album, ‘Callan Bridge’, was released by the Nashville-based company Compass Records in early October 2002. It was recorded over several months on two continents during those intervals when the brothers’ tour itineraries made it possible for them to get to the studio. Practice time was limited, but years of playing together have given Niall and Cillian a near-telepathic musical understanding, as demonstrated by the extraordinary note-for-note synchronicity achieved in their duet selections. They were also helped out by some of their friends, who happen to be among the best and most innovative in the business: for the Philadelphia recordings U.S.-based guitarists Donal Clancy and John Doyle; and for the sessions in Ireland younger brother Caoimhín Vallely on the piano and Armagh guitarist Paul Meehan. Six original tunes by Niall are balanced by a number of pieces unearthed from old manuscript collections. The boys from Armagh play these melodies, which for decades existed only as fading dots on forgotten pages, not as antiquarian curiosities but with a vigorous virtuosity that brings them fully to life and affirms the unbroken continuity of the Irish musical tradition. ‘The Reel of Rio’ is a tune we’ve been playing at the Armagh Pipers’ Club for years, and was composed by Sean Ryan. We found ‘All Round the Room’ and ‘The Merry Thatcher’ in Ceol Rince na hÉireann IV, a book of tunes edited by Jackie Small. This is a jig I wrote just after my daughter Muireann’s first birthday. ‘The Humours of Tullycrine’ is a hornpipe which appears to have its origins in Co. Clare. I first learnt it from a great concertina player from Bessbrook in South Armagh called Ciaran Burns. This version was also influenced by a recording made by Brendan Keenan. Our cousin Fintan Vallely was our source for ‘The High Jig’, which was composed by Clare fiddler Junior Crehan. Cillian learnt ‘Robbie Hannon’s Jig’ from New York piper Jerry O’Sullivan who had learnt it from Belfast piper Robbie Hannon. ‘The Sunnyside Jig’ was written after a particularly enjoyable week in Sunnyside in New York. Cillian got this version of ‘An Buachaill Caol Dubh’ from the acclaimed piper Leo Rowsome who recorded it on “The King of the Pipers”, the earliest recorded LP of uilleann piping. ‘Molly From Longford’ is a slide version of a reel recorded by the legendary piper Patsy Touhey in the early part of the 20th Century. ‘The Argyll Lassies’ is a Scottish tune that I learnt from US-based fiddler Brendan Mulvihill. Cillian first heard ‘Jenny Dang the Weaver’, another Scottish tune, played by Armagh musician Peter Grew. ‘Malfunction Junction’ is named after a place in Missoula, Montana, which I came across during a US tour in March 2002. Three jigs learnt from three different fiddle players. The first tune we’ve named after Bríd Harper from whom we learnt it - Bríd, born in Donegal and resident in Tyrone is always a good source for interesting and unusual tunes. ‘The Munster Lass’ came from a book of tunes compiled by Sean Maguire and Josephine Keegan - two more famous northern fiddle players. ‘Scully Casey’s’ was recorded by Kevin Burke and Jackie Daly on their album ‘The Eavesdropper’. ‘Once in a Blue Moose’ was named after a shop I came across in Anchorage, Alaska during the Irish Festival there in 2000. The first two tunes on this track are versions of ‘Allistrum’s March’, a longer piece of music which describes the Battle of Cnoc na nDos in North Cork in the 18th Century. ‘Johnny Loves Molly’ appears to be a slip jig version of the better known tune and song ‘An Rógaire Dubh’ (The Black Rogue). 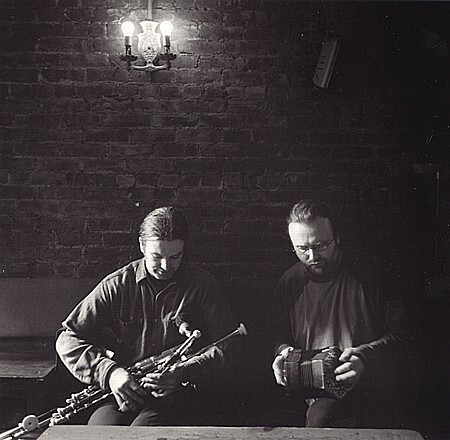 ‘The Singing Stream’ is part of a longer piece of music for four uilleann pipers that I wrote for the William Kennedy Piping Festival in Armagh in 2000. It is dedicated to our good friend, the late Mark Donnelly, who was Cillian’s pipe teacher for many years. ‘Dowser’s Favourite’ is another tune from the Ceol Rince collection while ‘Callan Bridge’ is named after the place in Armagh where myself and Cillian grew up. ‘An Buachaillín Bán’ is a song associated with Co. Waterford and particularly the singing of Nioclas Toibín, although it was written in Carraig na bhFear, Co. Cork by Mícheál Ó Liongáin. The ‘Fair-haired Boy’ is a coded reference to Bonnie Prince Charlie. I first started playing this with my partner Karan Casey. ‘The Humours of Derryloughan’ is a great favourite of our father’s, and although we’ve been playing it for years and years, it’s the sort of tune you could never grow tired of. Cillian first heard ‘Old Tipperary’ on a great recording of Robbie Hannon on the album ‘The Piper’s Rock’. We finish the album off here with a blast of reels we learnt at the Pipers’ Club, starting off with the piping classic ‘The Old Bush’. Tracks 1,2,4,6,8,9,13 recorded by John Anthony at Maja Studios, Philadelphia, USA. Tracks 3,5,7,10,11,12 recorded by Dan Fitzgerald at SoundSound Studios, Cork, Ireland. Photography: Timmy Whelan and Joerg Koester. Everyone involved in the recording of this album - Donal, John, Paul, Caoimhín, DanDan, John Anthony and everyone at Maja. Stuart Ongley and all at SGO. Lunasa. Matt & Mitch Greenhill & Mary Katherine Aldin. Tom Sherlock. Benedict Koehler, David Quinn, Alain Froment, Phil Hardy. Timmy Whelan, Joerg Koester. Donncha Gough. Frank, Ciarán and all at www.madfortrad.com. Billy & Donna Durkan. Don Meade. Karan, Muireann, Katy, Lorcan and Máire. Special thanks to our parents Brian and Eithne Vallely whose love and encouragement made this all possible.